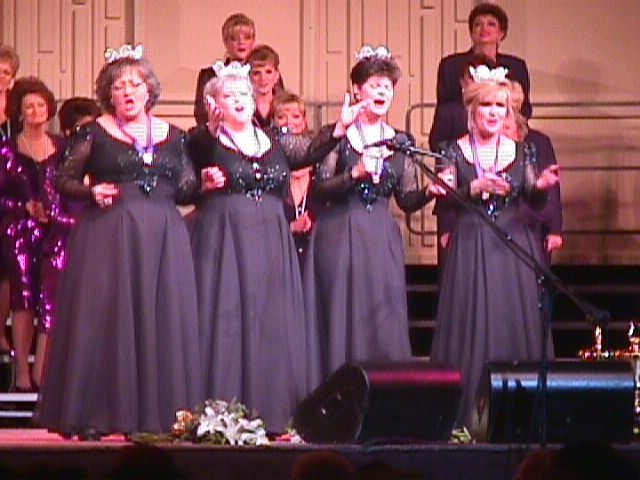 RUMORS QUARTET AND RICH-TONES CHORUS WIN QUEENS OF HARMONY AT THE SWEET ADELINE INTERNATIONAL CONVENTION. MIKE HENSLEY, MEMBER OF THE SINGING PLAINSMEN, IS THE FATHER OF CHARLA CLARE....TENOR IN BOTH GROUPS!!!!! The Following is an account by Debbie Warwick, Harmonet Reporter. Black gorgeous gowns with sheer sleeves and a black sequined bodice. BALLIN' THE JACK- They do a pretty cute demo of the dance as they try to teach it. Then they do the whole thing doubletime and Dale tries the same demo but isn't quite up to the task! Dale steps up to the mic and starts to speak, but then pulls up her sleeve and checks her watch.... and decides not to say anything! The audience roars, showing their approval of the choice! Then Charla got a solo feature called THE LADY DOWN THE HALL, and it was so beautiful. This is the only song lyric that really got to me this week. Absolutly lovely, and very well done! Dale begins the next part by slowly taking on a "little girl" character as she explains that when she was a little girl she had a best friend (Zachwy Bowden's sister Bawbwa Bowden) who had a really neat doll which was pretty special! As she is telling us this, the other three are putting on pony tail wiglets, and other little girl's things, ending by putting a short orange pinafore on Dale. Kira is no longer melted in her seat. Now she's rolling on the floor as is most of the audience!! (for those of you who don't understand the joke, you must know that last year at International, Rumors lost this same contest because of a time penalty in the show package.) End of the Finals!! [During the break I learned from Dale Syverson that at least a couple of those lines were supplied by none other than Debbie Connelly, lead of 1993 Queens Showtime, and no slouch with the parody pen. They had a good time working on that song!] Classic Edition performed while the judges were taking a break and the scores were being tallied. HARD HEARTED HANNAH BIRTH OF THE BLUES HOW HE MAKES ME FEEL - I love this song... � (the standing ovation leaves Susan visibly moved) "The most asked question this week has been, "How was your year?" We left SLC with a lot more stuff than we went with.... crowns, medals, trophies... In the airport as we were leaving, a gentleman observed the entourage of four ladies, all dressed alike and wearing medals, carrying the trophy and huge bouquets of roses and wearing CROWNS. He finally remarked, "obviously you've won something". YOU CAN GO THE DISTANCE An' when I go the distance, I'll be right where I belong. Neat song. Kira says it's from Hurcules Do you hear the beat? SOUTH RAMPART STREET PARADE In a few moments we �_ l have brand new Queens, and the jury is still out (among the stands) as to whom that will be. Some say Swinglish Mix has a pretty good chance, and others feel there's no question that Rumors will leave with shiny hats tonight. Personally, I loved them all. This was the most incredible assemblage of barbershop talent I've seen in quite a while, and wonderfully entertaining! Each of the quartets is called back onto the stage in the order that they competed. Without delay, they begin the announcements. Black pants with a shiny royal blue "cutaway" top, with tails nearly reaching the floor. The long black sleeves have multi colored long fringe hanging from the shoulders. HIT THAT JIVE JACK - Snappy dancing by the front row with a lot of jitterbugging. The sound was supurb, but I guess I don �� have to tell you that. Announcer: "When Mother used to put us to bed, she would sing us her favorite lullabye. She'd start out real slow, but pretty soon the whole house was ROCKING! ROCK-A-BYE YOUR BABY - Great! A really snazzy bit of choreo, including the classic Al Jolson kneel. These gals dance as well as they sing! PAL OF MY CRADLE DAYS- I heard this is a new Joni Bescos arrangement, and it �� really powerful! The softness builds into a tremendous wall of energy, and then fades back to the softness with little apparent effort. Dale: "I wanted to get a little advice on this next number, and so I thought I'd take it to my music team. This was probably a BIG mistake." "There are the liberals.. and the front row..they want to do all the fancy dancing and jazzy numbers." "The Conservatives want to do the oldies." Dale again: "I'm in the middle, a moderate from the midwest. Yo... I'm a baritone. And so we decided to compromise." Liberal: "We're going to do it MY way!" TURN THE BEAT AROUND Turn it up.. Turn it up.. Turn it upside down. This looks like an aerobics class! THE BEAT GOES ON - I've never heard this song done quite like this before! "Cher spends money stayin in her prime, and the beat goes on." ..."love to hear percussion!" RUMORS comes back to entertain us while the scores are being tabulated. MOONDANCE - as Judy started to get revved up in the jazzy part she got a "You go, girlfriend!" from Dale! THE LADY DOWN THE HALL is (IMHO) the most beautiful song of the entire week. "The lady down the hall doesn't like to hear us fight... she only wants to know that everything's alright, and she's keeping an eye on us." Peggy :"Thank you... Charla's our secret weapon in more ways than one. We'd like to thank a few of our supporters.... and Believe me, when it comes to Rumors, it takes a village. (insert list of family, and a lot of other including Joe Liles, Keith Houts, Darlene Rogers, Sharon Babb, Michael Gellert, etc., etc.,) and one very special person to all of us... We finally got smart and hired ourselves a manager, Judy Winters, our O.C.O. - "Oh Cherished One!" The one thing we want to leave you with here today, is how tickled we are. You just can't imagine how wonderful it is! Karen returns to the stage and begins by offering us some statistics about the competition. We have had contestants from 27 regions. The largest chorus had 149 members. The smallest had 57 members. In addition, there have been 20687 Sweet Adelines crossing this stage. 5. � 2673 � - Pacific Sound Presented by Tori Postma and Laura Gliedman, director and president of the Mountain Jubilee Chorus. The audience sings "Send Your Love" to the Rich-Tones as they are making their way to the stage, passing right in front of us. There is chaos on stage, but Karen says she doesn't have the heart to tell them to be quiet. In closing, the chorus gives us one more stirring performance of "Rock-a-bye Your Baby With a Dixie Melody." Just before they start the song someone in the front row makes a comment to Dale, pointing towards Charla standing there in her long "Rumors" dress among the rest who are wearing pants. Dale turns to us, and tells us to "Watch right there, when they do the gymnastics near the end. That's where the action will be!" Sure enough when they get to the kneeling "Al Jolsen" bit, her dress gets caught up in the fancy footwork but she manages quite well, without losing her balance or missing the move. Then she deftly and delicately picks up her skirt as she rises to do the same move the second time! The audience instantly gives their approval of her quick solution! They might as well have put a spotlight on her, because no one missed it! Pretty classy recovery! * This story goes back to a dog named Linky, that Dale Syverson had when she was a child. When she was away at camp, the dog died. Her family came to pick her up at camp and her little brother, about 4 years old and eager to share the news, came bounding up happily declaring, "Linky died! Linky died!"